Just a little preparatory talk. 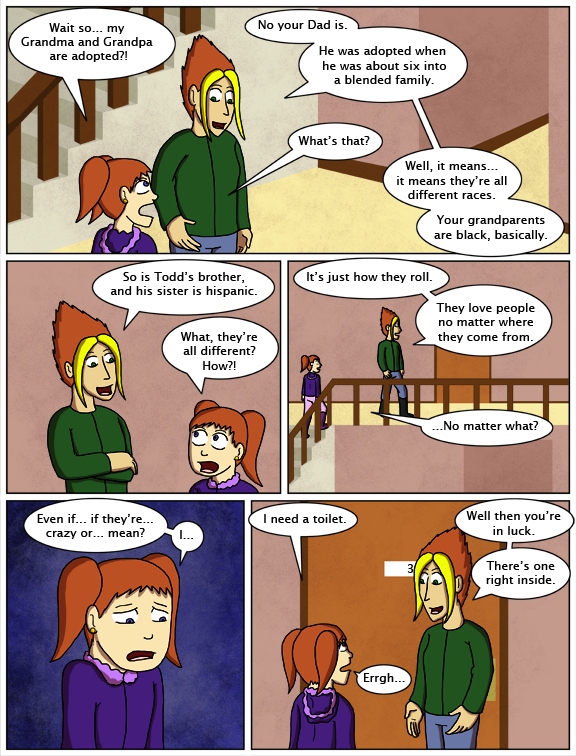 I thought about using this part to re-create the scene where Selkie is surprised by the racial differences between Todd and his parents, but it makes more sense to me that Andi would want to prepare Amanda for it ahead of time to avoid awkwardness. Well, at least she admits it. I’m glad to see Andi getting that panicky ‘deer in the headlights’ look out of her eyes and talking like an adult. We’ll see how that holds up through the course of the evening, but at least she’s starting off right. And… aww. Poor scared Amanda. Good thing Theo and Mari are going to live up to their billing, and then some. Well, that’s what good family does. Dysfunctional family shuts you out, or cuts you off, or tries to make You change to suit Themselves. Good family accepts you, no matter what. — that said, that doesn’t mean that they will put up with trying to put stuff over on them. Another indicator that Andi does have it in her to be a good parent. “They’ll love you no matter what” is something that Amanda needs to hear a lot more of. Amanda, my family loves me even with my type of “crazy.” That’s what family does. And trust me, you aren’t crazy. You have a few issues, yes, but you aren’t crazy. Having family that loves you and learns how to deal with your issues as you deal with your issues makes it a lot easier. Yes, this is such a good talk that it is practically out of character for her. She’s firm and confident about how good these people are; it almost seems like she didn’t avoid their help all this time. It’s a good sign for the future of Andi, for sure. And I adore these vulnerable!Amanda bits. She has grown on me a lot as the story has progressed. I don’t think she had been avoiding them all these years, it sounded to me like she and Todd were very involved in each others lives and were together until a few months ago when they broke up. Remember the scene where they were talking to Todd about Andi and lecturing him and he regressed to six? They consider Andi part of the family and I thought they had sort of “adopted” her too like good parents do. She probably has boatloads of guilt about lying to them too re:Amanda. One year at Christmastime, my mom and I were in the kitchen. She looked around at the family – multiple conversations, jokes being tossed around, lots of laughter. TOTAL chaos. Wow, I always thought Todd’s sister is Asian. Isn’t her name Marta? That’s a distinctly Latino name, definitely not Asian. Maybe she’s Filipino? Remember that the Philippines (an Asian archipelago) was ruled by the Spanish for about 200 years before it became a U.S. colony after the Spanish-American war, and a lot of Filipinos took Spanish names during that time. Yeah, I always thought she was Filipino. Really? Why, because of her straight dark hair and glasses? I honestly always got a more Hispanic feel from her. Her features and name just dictated it for me. Not to mention that wedding dress. Not that it was her dress, but it just had such a Latin vibe to it, especially on her. You know she’s Latino (whatever that is) because Marta is a “distinctly Latino name”? And Antoine and Theodore are distinctly black names? And Andrea is distinctly Caucasian? You can’t go by names. In the US, right now, Antoine is a predominantly Black name, yes. I don’t know about Theodore, but from media and so forth, I get the impression it is more popular among Black people than others. Some Hispanic folks *do* look very Asian—depending on what part of Mexico/South America they come from. This is because the indigenous peopl to the American continent were/are actually descendants from Asia and Hispanics often are a mixture of those Native Americans and Europeans (usually Spanish). I recently made an embarrassing mistake of assuming a family that was Hispanic was Asian, because they looked very much like they were from the Philippines or Thailand (they looked a lot like one of my best friends who was Thai/Caucasian). The children had very slanted eyes. It was a good lesson never to assume anything until you talk to get to know someone. And I often forget one of my best friends is interracial because she looks so white, but she’s actually part Hispanic. She said it makes for an interesting time when hearing other white people talk bad with her about Hispanics. I’d actually been wondering whether you were going to repeat that scene, but I’m glad you didn’t; I agree that it makes more sense this way. I agree; if Amanda just had the same reaction Selkie did, it might have been just too coincidental. Taking a different approach is definitely better especially since if Amanda reacted the same way, it would have also been a bit out of character. What Andi should have prepped her for is the grandparents are going to mob her with attention the second she walks through the door. Honestly, points to Andi here for getting this conversation out of the way before they get to Todd’s place. There’s no telling how Amanda would have taken it to just walk in and find out that adoption “runs in the family” like… was it Mari who put it that way? I can’t remember for sure, ha ha. Selkie seemed to love it, sure, but Amanda has already had one botched adoption, it could have gone sour to surprise her that way. Good job, Andi. This was actually a responsible, sound decision. I knew you could do it. Hmmm… I may be wrong here, but I’ve always been under the impression “blended family” means two parents remarrying (usually with kids on both sides). “Interracial family” means having two or more people in the family of different races. That is how the terms are used on a couple parenting boards I’ve been on. Oh my god poor kid. She’s so used to being “bad” she’s got hedgehog all around her. At least Andi’s proving to be good at this thing, despite haters. I guess you’d put me in the “Andi hater” box, and yeah, I’ll be happy to stay there until she comes clean with her lies and starts apologizing to the right people about lying about Amanda’s death, and then trying to use her to get back with Todd, and being totally insensitive about adoption/adopted kids. She’s got a long way to go to stop being a spoiled brat in my mind. Amanda’s innocent of her mother’s wrongdoings, but she’s got a great big heap of her own. And needs serious therapy. Children don`t have an instruction manual, so Andi can just do her best. It`s a good sign she`s doing this, just remember she cracks she runs or cries for sympathy. I don`t see why you`re getting after the haters this time. No one said anything about her. I`m waiting for her to retreat yet again, it will happen. Oh, I think she’s good at many things, but she has a lot of growing up (and healing) to do. It also doesn’t negate the damage she did. Luckily, the folks she’s hurt are resilient and loving so hopefully all will heal (and grow) together. Well played Andi, well played. In real life, therapy is often a good idea. When someone’s very badly messed up it is usually because they’re drowning and nobody near them even knows how to swim. Therapists are professional life guards. They’ve been trained in how to perform a rescue. But that’s not much of a story. In fiction, unless the story is signaled to be about therapy from the beginning (and Selkie is clearly not that kind of story), it’s more interesting and satisfying if the rescuers are bystanders — ordinary people without academic qualifications who just happen to have learned something about swimming. Unrelated to todays comic (but very much in line with the overall theme) I wanted to tell everyone the absolutely wonderful news I have! I finally, finally after years of trying managed to get my records unsealed and found my birth mother! I mean I literally found her through Google and had a meeting arranged by the very next day. It is so amazing and wonderful that I am just sitting here utterly stunned, I look like her, we have so many things in common it’s kinda of scary. And she wanted me, she really wanted me but at the time society and the dr. thought it was best to adopt out an so that’s what she did. It has been a healing balm to the never-healed wounds on my heart, wounds that I ripped open every few years searching and kept hitting up against the same brick wall (sealed records). I just wanted you to know, this comic has been something I’ve followed for years because I think it is the only one that actually has adoption as a major theme. That’s awesome news, though! Congrats on finding your mother, it’s awesome that it went so well! I hope you to can have a great relationship now! That’s wonderful, Blue Coyote! I’m so happy for you! Wishing you many happy years (and discoveries) with your birth mom. Allow me to tell you congratulations. I found my little brother a few years back but didn’t like seeing his rap sheet so I haven’t approached him. But I’m glad to see you are getting a happy turn of events. Good on you. Hurray and all my best wishes for the upcoming meeting and future developments. WOW. That is amazing. Please report how it goes! There’s an audience here that is specially tuned for, and has, I think, a more profound than usual understanding of, stories about disrupted family. We’re all rootin’ for ya…. “I need a toilet.” Read: I need some time to prepare emotionally(for this). I avoid this kind of drama, because I can never read when to push from when to back off. What she lacks in “crazy”, she more than makes up for in “mean”, unfortunately. I think I would have said something like “Especially if they’re crazy. That’s why I get along so well with them.” with a big, goofy grin. Couldn´t have put it better myself. Actually… GOOD THING she isn’t going to say it that way! Never tell a child “You are a bad person.” Tell them instead, “This is bad behaviour. It stops now.” Then expect that it will stop. Always focus on actions and on the future — on things the child has some power to control and to do differently. That’s not going to work perfectly, because nothing’s perfect, but telling her she’s a bad person isn’t going to work at all. And don’t be cruel! Don’t intentionally threaten any child with loss of love, ever — especially one with major abandonment issues. Yeah, no, that will not work. That will only make things far worse. Amanda needs love, patience and understanding. Should they let her constantly berate and tease Selkie? Of course not. But instead of threats and punishment, how about asking her WHY she does these things? Amanda spills her guts about what she felt when she was returned. How she felt ignored and alone and that no one cared about her. Not only would all the adults be horrified and suddenly understand, but they could explain how it wasn’t Selkie fault at all. AND they could explain to Selkie why Amanda did those things to her. How she was not only abandoned, but abused. It’d be good for EVERYONE involved. Especially Amanda, who definitely deserves some love and closure. Amanda has it way worse off than Selkie does. Selkie’s mom loved her and told her she loved her. Think of how Amanda will feel if she ever finds out her mom told everyone she was DEAD. Think of how much damage Amanda has. They don’t need to stop loving Selkie or stop giving her their attentiom, but Amanda has some deep rooted psychological issues from abuse and abandonment that NEEDS to be addressed. She needs love and patience, not threats that will ultimately drive her even FURTHER AWAY from her new sister. Somebody sitting down with her after all that and telling her she is loved and now is time for a new life would be good. “What you’ve done in the past, it was in pain, it was lashing out in earned anger. You had the right. But as of this, we start fresh. We cannot change what happened, all we can do is reach out in love. What you’ve done is over. You start fresh, you start new in your true family.” She’ll still backstep of course, but she needs to know she can start over. I’m thinking of how much damage she’s inflicted on Selkie. Is it really in any way shape or form fair to *her* when Amanda gets a free pass on it because she wasn’t loved enough and let it warp her into the spiteful little brat that has done her level best to make the past five or so years of her life as unpleasant as she could? It’s nice to see Andi has calmed down some. I’d like to think the fear of facing Todd’s parents has been replaced with the excitement of introducing them to Amanda. Finally Andi! Good on you. “I need a toilet.” – I’ve used that one myself.